CREATE A BEAUTIFUL CEILING IN A VERY ECONOMICAL MANNER PVC Decorative Ceiling Tiles by Ceiling Tiles By Us is a PLASTIC Ceiling Tile and available in the market since last 15 Years. This creates a Great Do it yourself project or a new or addition to an existing business. They are manufactured from High Quality Polyvinyl Chloride Sheets, dimensional embossed to create three dimensions effect, and the greater artwork is created with various colors & effects, some are hand painted. The combination of the above process results in an extraordinary and incomparable outlook and appearance. The PVC (Plastic Ceiling Tiles) are available in the size of 24″x 24″ it is available in 40+ Beautiful designs, almost in any color shade or combination of 2 or more colors available. The effect like Metallic (Gold, Silver, Copper etc. ), Pearl shine etc. which make it stylish and aesthetic. 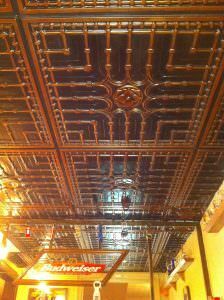 Plastic Ceiling Tiles look like Tin or looks like real metal or Copper or Silver etc. The PVC Ceiling Tiles with overlapping edges can be fixed on any Hard & Plain Surface with any good quality rubber base adhesive, such as DAP Original Gel or Loctite Power Grab All Purpose Construction Adhesive. The Ceiling Tiles for Grids, Drop or Suspended Ceilings will drop in the Grid. All PVC Ceiling Tiles can be glued to existing Acoustical Ceiling Tiles (If using Overlapping Edge Tiles, trim the approx 1/4″ Overlapping edges and insert into the grid. They can be used in Homes, Offices, Hospitals, Schools, Hotels, Motels, Business complexes, etc. As they are very economical & having the best quality. SKU: SKU00126 Categories: CEILING TILES ALL TYPES, Ceiling Tiles Glue Up Overlapping Edges, Close Out Sale Up To 50% off! Sale Discount Price applied and as listed to each product in this section & page, No Other Discounts or Coupon Codes Apply., Drop In Ceiling Tiles Grid Suspended, Drop In Commercial Washable Ceiling Tiles, Melt Away Ceiling Tiles, Plastic PVC Ceiling Tiles 24x24 Select Grid or Glue Up. We are Ceiling Tiles by Us! 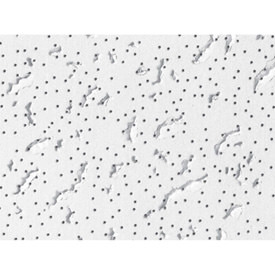 Create a beautiful ceiling in a very economical manner with beautiful PVC (poly-vinyl chloride) decorative ceiling tiles from ceiling tiles by us. 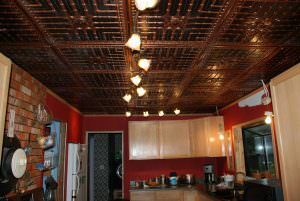 Our plastic ceiling tiles have been available in the market for many years. This concept creates a great “Do it yourself” project or, a new look to an existing business. They are manufactured from High Quality Polyvinyl Chloride Sheets and, dimensionally embossed to create a 3D effect. Moreover, our plastic ceiling tiles are created with various colors effects, which some are hand painted so deeper color variations exist. The combination of the above process and Artwork results in an extraordinary and incomparable outlook and appearance with various colors and effects. They can be used in Homes, Offices, Hospitals, Schools, Hotels, Motels, Business complexes, etc. Their quality and economical value are exceptional! The PVC systems are available in the size of 24”x 24” and are available in 40+ beautiful designs in any almost any color shade. A combination of 2 or more colors is also available. You may enjoy wood-like effects that resemble real wooden grains, Metallic (Gold, Silver, Copper, Pearl Shine etc.) all of which create stylish and unrivaled beauty. Provides you with an extra and unique edge for your decoration. Multiple designs available in all colors. Define the intended use and compute the number of Ceiling Tiles Needed by the actual dimensions of the space you are working with. It is suggested for your project you add an additional 10 to 15% as waste error overage. Example for a room with dimensions of 10 feet x 10 feet there exist 100 square feet of ceiling adding 15% makes 115 Square feet divide by 4 as each 24 inch x 24 inch PVC Ceiling Tile equals 4 Square Feet equals 28.75 rounded up to 29 as the recommended tiles needed. Additionally, the decorative ceiling tiles can be applied to most hard smooth clean surface such as plywood, drywall, and plaster, ceiling or wall. For your convenience, the PVC ceiling tiles can be cut trimmed with scissors or box cutter for desired fitting size. Mostly used in commercial or residential projects where the expensive 3 dimensional metal look is desired but the budget for real metal is not there. 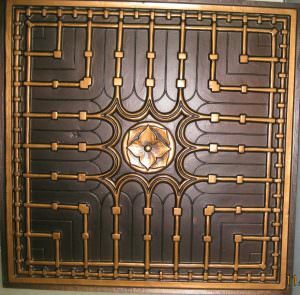 Plastic Ceiling Tiles look like Real Tin and can look as great and many say better than real metal including Copper or Silver etc. The PVC Ceiling Tiles with overlapping edges can be fixed on any Hard & Plain Surface with any good quality rubber base adhesive, such as DAP Original Gel Contact Cement or as we prefer Loctite Power Grab All Construction Purpose Construction Adhesive. The reason for our preference is contact cement instantly adheres upon contact. Contact cement gel allows a little time, seconds only, to maneuver into desired final position. With Loctite Power Grab All Purpose Construction Adhesive the installer has more time, estimated 15 to 20 seconds to align and maneuver into desired final position. The PVC Ceiling Tiles designed for installation to a clean smooth surface with overlapping edges can also be used for Grids, Drop or Suspended Ceilings will drop in the Grid. 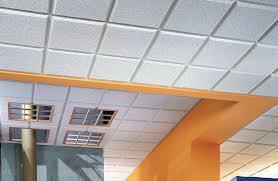 All PVC Ceiling Tiles can be glued to existing Acoustical Ceiling Tiles. All of our faux tin PVC glue up tiles are available in a 2 foot X 2 foot size. This is a standard size of design and customer should exercise caution to be aware of their intended use of the product. As an example the PVC Ceiling Tiles designed to glue to a clean smooth surface are from edge to edge approximately 24.5 Inches x 24.5 inches. This allows the tile to be glued up with an overlapping edge of approximately ¼ inch. When these overlapping edge tiles are used for a Drop In Grid or Suspended application the actual design is 24 inches by 24 inches. In reality that again is a standard measurement in that the Standard Grid Ceiling System in the United States is designed to accommodate the actual Grid Size of approximately 23 ¾ Inches x 23 ¾ Inches. Just follow these 4 simple steps to install our 24” x 24” Overlapping Edge Decorative Ceiling System to most any clean hard smooth surface. It is really quick and easy. We recommend that all customers always test the application and allow it to rest at least 24 hours to evaluate the process and results to make an informed decision as whether the application is right for your particular scenario. Apply any good quality urethane or rubber based adhesive only on the edges and raised portions of the PVC Ceiling Tile we recommend Contact Cement Gel by DAP Weldwood Original Formula or Loctite All Purpose Construction Adhesive to the back of the tile. If using Contact Cement we suggest you let it dry until adhesive solvents evaporate. Please check the drying time on the pack of the adhesive, usually it is anywhere between 2-5 minutes. Applying the adhesive on the ceiling also will improve bonding and strength. Approximately, 1 gallon of adhesive will be enough to cover 75 tiles or 300 square feet when used on both, the tiles and the ceiling. Place the sheet in the required position (first sheet at the 90 degree point if that is your desired installation method) and press firmly but gently. Overlap the edges with the previous sheet and press firmly with fingertips using gentle pressure. After completing first straight row work your way to the sides. Exercise caution not to get adhesive on fingers or onto the ceiling tiles. 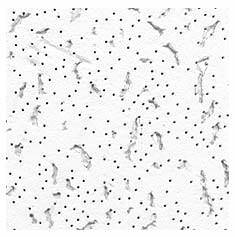 The use of Contact Cement adhesive can easily get on the fingers and then on the ceiling tiles. These smudges of adhesive can be difficult to clean and the solvent used to clean can distort the Paint Color of the Tile. CONGRATULATIONS – YOU NOW HAVE A BEAUTIFUL DECORATIVE CEILING!